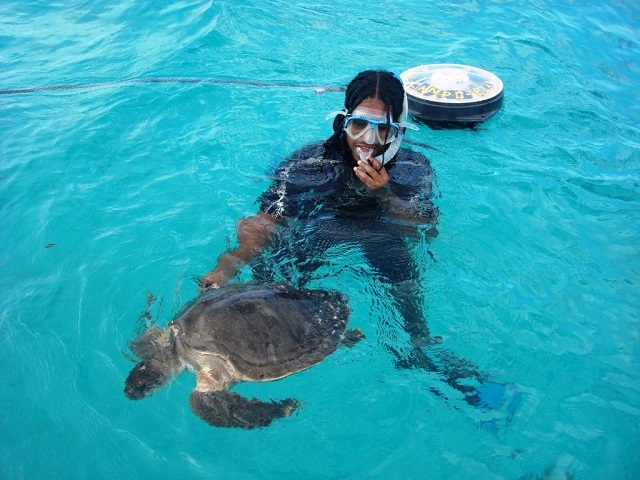 (Seychelles News Agency) - Seychelles, an archipelago in the western Indian Ocean, provides fertile feeding grounds for five species of turtles. The islands are nesting grounds for only two species who according to local expert Jeanne Mortimer find the Seychelles safe enough to lay their eggs. Sea turtles in Seychelles are protected under the Wild Animals and Birds Protection Act, and the poaching and killing of the species are illegal. While the species nesting in Seychelles can be seen often, the others are not so easy to find. SNA details the five species that feed in the islands. 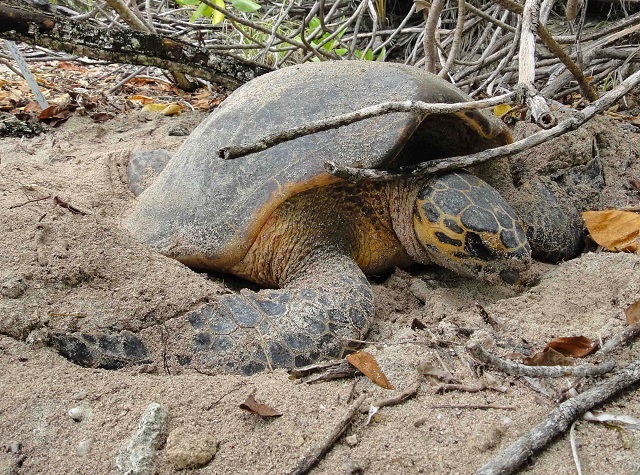 Named because of their narrow pointed beaks, hawksbill turtles lay their eggs in daylight in Seychelles. Seychellois turtle expert Jeanne Mortimer said that the nesting sites of this species have been heavily exploited so much globally, that Seychelles and Chagos islands -- 1,500 kilometres east of Seychelles -- are the among the only two places where they “feel safe enough” to nest in daytime. The best islands for visitors to see nesting hawksbills are Bird, Denis, Cousin, Cousine, North Island, Alphonse and Fregate islands, also. Also in the south of Mahe and at Lemuria Hotel on Praslin. Juvenile (foraging) hawksbills can be seen throughout Seychelles underwater when snorkelling or SCUBA diving. Hawksbill is listed as critically endangered by the International Union for Conservation of Nature (IUCN) due mostly to human impact. The species grow up to about 114.9 centimetres in shell length and 68. 75 kilograms in weight and their carapace is covered by thick scales.have a strikingly coloured carapace and while young. This species is also listed as endangered on the International Union for Conservation of Nature, (IUCN) red list. The best place to see them is Aldabra, Cosmoledo, Astove, and Farquhar atolls. The adult green turtles are most likely seen in the outer islands like in the Amirantes group, and a few nest in the inner islands where , but they are now very rare due to overexploitation for their meat. Like the hawksbill, juvenile (foraging) green turtles can be seen throughout Seychelles underwater when snorkelling or SCUBA diving. The second largest after the leatherback, the green turtle can weigh up to 225 kilos and reach 113 centimetres in length. The adult is a herbivore, dining on sea grasses, seaweeds, algae and other forms of marine plant life. In Seychelles, green turtles are threatened mostly by people killing them for meat and by loss of nesting beach sites caused by coastal development. Other global threats to the species are overharvesting of their eggs, hunting of adults, and being caught in fishing gear. 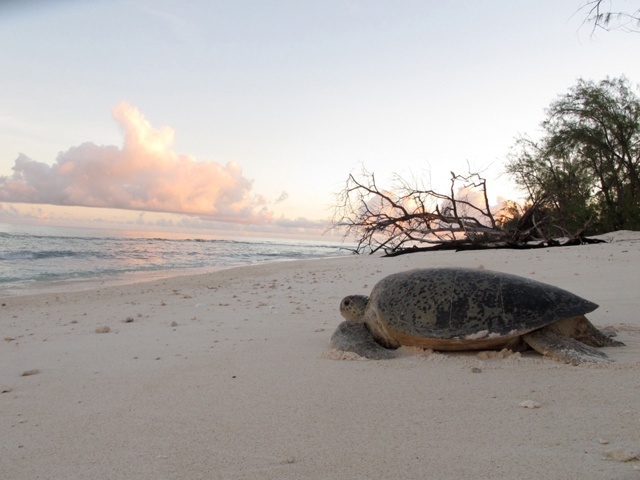 Green turtles travel huge distances between their feeding sites and nesting sites, with mature turtles often returning to the exact beach from where they hatched. Loggerhead turtle is named for its large head that supports powerful jaw muscles, allowing it to crush hard-shelled prey like clams and sea urchins. Loggerheads are less likely to be hunted for their meat or shell compared to other sea turtles. 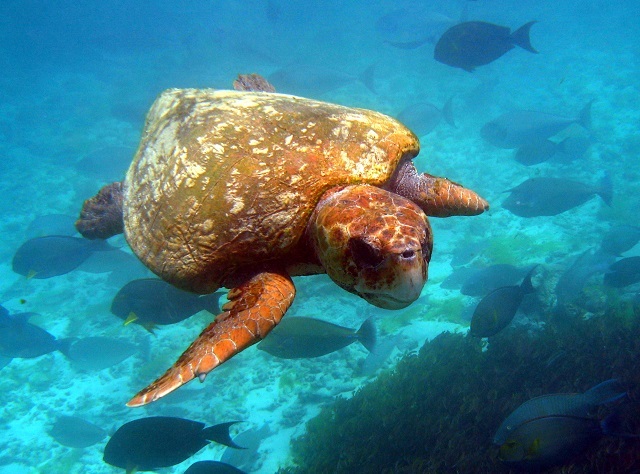 In Seychelles, loggerheads are occasionally encountered in the outer islands on feeding grounds, but they do not nest. It is listed as Endangered by the International Union for Conservation of Nature. The greatest threat is entanglement in fishing gear, the loss of nesting habitat due to coastal development, predation of nests, and human disturbances. Leatherbacks are the largest turtles on earth, growing up to almost 200 centimetres in shell length and 900 kg in weight. It is the only remaining representatives of a family of turtles that traces its evolutionary roots back more than 150 million years. While all other sea turtles have hard, bony shells, the inky-blue carapace of the leatherback is somewhat flexible and almost rubbery to the touch hence its name. They can be found in the tropic and temperate waters of the Atlantic, Pacific, the Indian Ocean as well as the Mediterranean Sea. They nest in tropical areas, but not in Seychelles. The species is able to maintain warm body temperatures in cold water by using a unique set of adaptations that allow them to both generate and retain body heat. 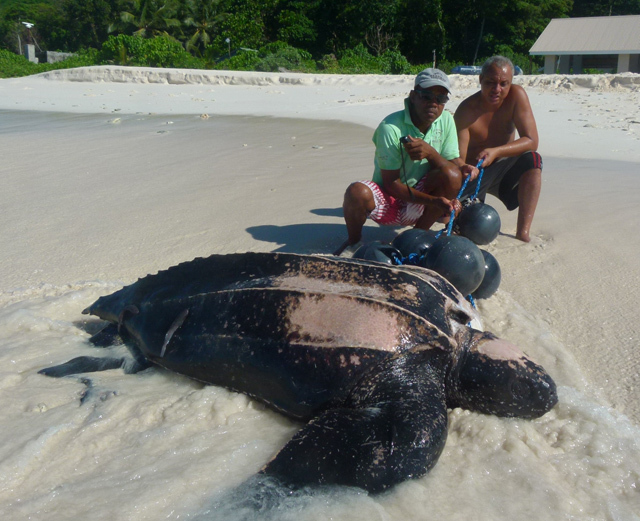 Many leatherbacks meet an early end due to human activity. The biggest threats are entanglement in fishing gear, egg collection, and destruction of nesting beaches by coastal development. The olive ridley named for the generally greenish colour of its skin and shell or carapace is the smallest of the sea turtles, weighing up to 45 kg and reaching only about 60 centimetres in shell length. Olive ridleys are found only in warmer waters, including the southern Atlantic, Pacific and Indian Oceans. These turtles are solitary, preferring the open ocean and migrate hundreds or even thousands of miles every year, and come together as a group only once when females return to the beaches where they hatched and lumber onshore, sometimes in the thousands, to nest. Although the species is widely considered the most abundant of the sea turtles, by all estimates, it is in trouble as its numbers, particularly in the western Atlantic, have declined precipitously. The greatest threat is entanglement in fishing gear.